In an unusual preview of next year’s budget not due for weeks, Gov. Larry Hogan drew the line for legislators already planning to spend more money than he wants. Hogan said he will spend every dollar the law forces him to do through legislative mandates and formulas, but he won’t spend any more even if the legislature tries to force him by “fencing off” extra spending, much as they did on $68 million in school aid last year. “Fencing off money will not work,” Hogan assured legislators. “We’ll be happy to hold onto the money and build up our reserves,” since the unspent money goes to the bottom line. But he said he will not again attempt to roll back the gasoline tax hikes as he did last year when lawmakers shot down the proposal. He said he will propose a $17.1 billion general fund budget, with a rainy day fund of $1.1 billion, setting aside $250 million more than the 5% required, and a budget surplus of $440 million, much larger than what the legislature has typically provided in recent years. Because he is fully funding all mandates and offering a structurally balanced budget, Hogan will not be sponsoring what has become a standard tool of governors’ budgets — an omnibus bill known as the Budget Reconciliation and Financing Act, BRFA for short, that adjusts spending mandates and formulas to balance the budget. By not having a BRFA, the legislature will be restricted to cutting the governor’s budget as the Maryland Constitution intends. Any additional spending must be passed as separate legislation with a separate source of funding. Gov. Hogan, with his hair clearly coming back, explains his budget proposal at a Thursday press conference. At left is Lt. Gov Boyd Rutherford, on the right is Budget Secretary David Brinkley and fiscal advisor Bob Neall. 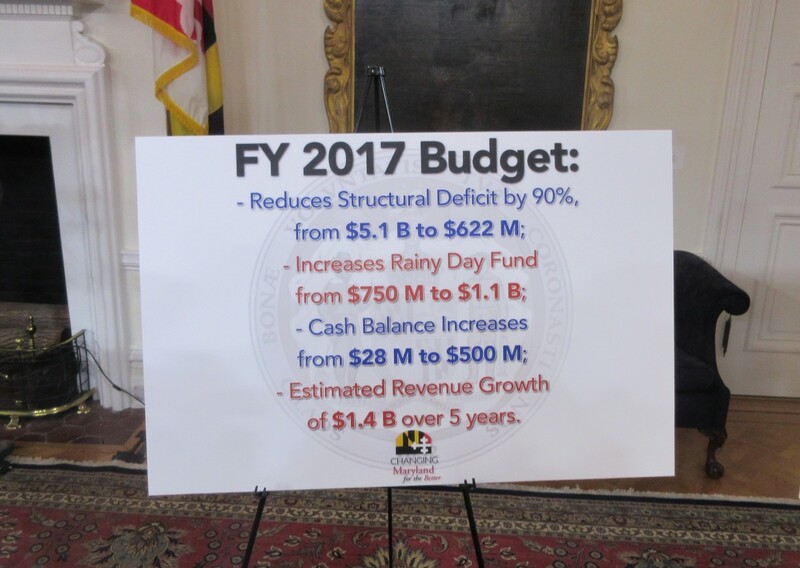 Hogan offered few specifics on most aspects of the fiscal 2017 budget. The lack of specifics was mocked by the Maryland Democratic Party and drew skepticism from a progressive oriented think tank. According to Orr, the reported cost over five years of the tax cuts is equivalent to about $80 million a year, more than all state funding for local health departments. “Because, as the governor pointed out, less than 20 percent of spending is discretionary, there is a very short list of options where those cuts can come from, including higher education, public safety, hospitals and other health services, and juvenile services,” Orr said in a statement. He pointed out that the governor’s $17.1 billion budget proposal for fiscal would be about $484 million less than what the Spending Affordability Committee recommended and $236 million below what the Department of Legislative Services said is needed to maintain current service levels.